A small tug (partially obscured behind the bow) maneuvers the Great Eastern, a 594-foot-long chemical tanker, into port at Mack Point in Searsport. Recently, the BDN ran an OpEd by Sierra Club attorney Kim Ervin Tucker, who claimed that the proposed improvement dredging of Searsport Harbor was not necessary. She implied that the depth to which the channel was designed a half-century ago is adequate for current and future shipping needs. To support her position, Tucker cited traffic information from the Navigation Data Center pertaining to Portland and Searsport. While the 23,137 vessel landings listed for Portland make for a truly impressive number, the data is of little value in an exercise ostensibly meant to review the parameters required to accommodate ocean-going commercial vessels, as the data includes vessels drawing as little as five feet of draft. The comparison is also flawed in that it failed to mention that the approach from sea to the inner harbor of Portland is actually defined by a federal navigation channel dredged to 47½ feet prior to reaching the 35-foot channel Tucker cited. In this context, the U.S. Army Corps of Engineers proposal to increase Searsport’s channel to 40 feet seems modest and prudent. Ships of all types are markedly larger today than they were 50 years ago when Searsport’s navigation channel was designed and built, and they require more room around and underneath them in order to maneuver safely. It is curious that an environmental organization would oppose an initiative that would actually assist the greenest form of transportation, ocean shipping, in protecting the environment by accommodating increased safety standards advocated for by the maritime industry. Minimum under keel clearance standards were a rarity 50 years ago; now they are the norm, and they are increasing in value. Those standards, while beneficial to safety, require more depth of water in navigation channels, and they still only represent a minimum value; some captains may require an under keel depth larger than the bare minimum. 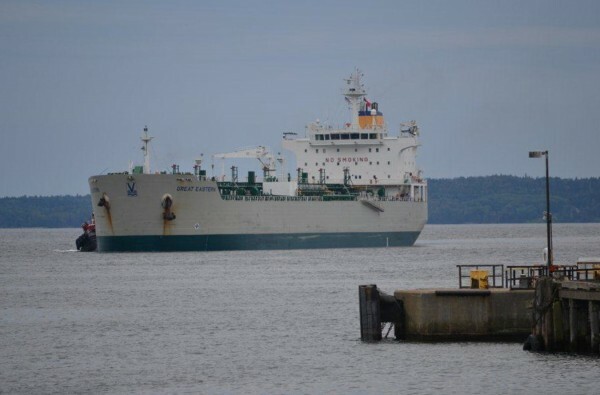 Two of the salt-carrying ships that recently called at the dry cargo pier in Searsport were “short loaded” by as much as 10,000 tons of cargo in order to reduce its draft and to maintain safe under keel clearances. Had those vessels been able to call on the port at full load draft, there would have been an extra 20,000 tons of much needed road salt available for use in the region this winter. The fishing community has genuine concerns about this project, and they deserve the information necessary to address their lingering questions. They also deserve not to be used as pawns in this issue by anti-port activists who claim concern for the health of the fishery but quickly forget the welfare of fishing families when the latest marine mammal protection initiative arises. Title 40 of the Code of Federal Regulations specifies what cannot be disposed of at sea and lists mercury, cadmium, known carcinogen, and oil of any kind or in any form, among many other things. The project must comply with these regulations, as well as 28 other pertinent laws, regulations and directives, including the Clean Air Act, Clean Water Act, Coastal Zone Management Act and the Endangered Species Act. After more than a dozen years of planning, there is no lack of oversight pertaining to this project. Given that the design draft of the freighters and tankers already calling at Searsport is as much as 41 feet, port opponents would do well to heed the assessment of this independent risk management report and support the channel improvement. Fifty years is long enough; it’s time to bring Searsport Harbor up to current standards for safety and competitiveness. Captain David Gelinas is a harbor pilot with the Penobscot Bay & River Pilots Association in Searsport. He is president of the Propeller Club of the United States Searsport/Bucksport Chapter, a member of the Maine Pilotage Commission and a member of the Maine/New Hampshire Port Safety Forum.